In Mark Irwin’s ninth full-length collection of poetry, A Passion According to Green, we find an accomplished and confident voice grappling with the realities of age, decay, and death, while also holding on tightly to the braided cords of image, language, and comparison. One of the volume’s welcoming epigraphs comes from filmmaker Stan Brakhage: “How many colors are there in a field of grass to the crawling baby unaware of ‘green’?” and serves as a fitting analogy to one of Irwin’s ongoing concerns in A Passion According to Green: to interrupt the speaker’s ego and sublimate the concerns of the self into a larger, stranger presentation of natural reality. Like many of the poems here, the title of the very first poem bleeds directly into the first line: “Events miniaturized, but always present / —Stumbling, tripping through the dark, last night / we glimpsed the Crab Nebula.” In lines typically packed with both contradiction and concision of image, Irwin’s “we” sees that nothing can be miniaturized to the point of disappearance, and that “stumbling” and “tripping” are often the first steps toward a lager realization, signified here by the Crab Nebula. The poet compares a “brute bumblebee” to “the wisteria’s lilac clouds” and then “an infant and a zinnia. The one’s crying becomes the other’s // vivid color.” This use of synesthesia as a sort of imagistic transference produces an unsettling effect, one that makes the poem’s conclusion all the more bracing: “Why didn’t I keep the letter sent / before you died unopened?” Irwin’s poems here are image and speech driven, but wholly unafraid to leap. Irwin’s poem “Open House” offers a deceptively simple slice of American surrealism that is by turns domestic and elegiac as a smaller house is found within a house for sale: “Now a child lifts / the roof off. Inside are figures just like us. Our breaths / make clouds. This is the way our lives start. This is the way they go.” Poem after poem, Irwin’s two-footed leaps into the irrational always land somewhere rich with meaning and lyricism. This thread continues in poems like “Psalm” and “Zoo,” where despite associative tangents and mind-bending images, Irwin seems intent on poems as containers of larger, universal meaning. In many of the poems, a sudden, looming “we” emerges to cast a long shadow over the poem’s conclusion and the reader’s experience. Not quite the democratic “we” of Whitman, Irwin’s use of the collective pronoun speaks to all readers as organic beings on the universal route from birth to death. The book’s titular poem accomplishes this lyric mode with stunning, dreamlike imagery and suspension of “normal” time. It is a poem that defies quotation, so I will simply urge the reader to seek it out. “Speed of Light” turns its clichéd title on its head by enacting various temporal leaps through the life of a romantic couple. “Gladiolus,” whether intentionally or not, consists of fourteen lines and takes on the function of a sonnet. The poem at first feels death-obsessed but is really image-obsessed, and Irwin manages a bittersweet cyclical epiphany for the plants losing their petals: “When the blossoms died, cattle fed on the stalks.” “Twist-o-Flex” continues this balancing of dark and light as it describes a speaker who has inherited a watch (maybe from a father?) that still carries the scent of the original owner. Irwin’s poems confront loss, decay and mourning directly yet always counter with wonder, awe, and an undiluted awareness of the present. 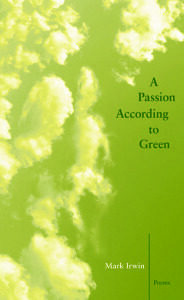 The third section of A Passion According to Green consists of a single poem in sections titled “Otherwise Than Our Bodies.” While the poem features constant shifts in time, place, and situation delivered by a confidently inquisitive lyric voice, it also strives to locate affirmation of existence and beauty in the face of existence’s inevitable wreckage: the loss of children, lovers, and friends. Irwin ultimately recognizes language as both barrier against and vehicle to this realization: “I want to touch the moment with all its scars, to lift both consonant and vowel / as the irises open in the daylight, and the pollen lingers on the slow kite of the page.” Everything is in motion and nothing is finished, as far as the senses are concerned. The collection’s fourth and final section juxtaposes tastefully surreal poems with poems that investigate language as medium. “There’s a jet” again allows its title to merge seamlessly into the first line, offering the fresh enjambment “in my mouth that devours words.” Later in the poem, a neighbor is fatally electrocuted while washing his car and then a deer wanders through the neighborhood as the inhabitants are gathered in mourning: “Look, / someone says, a deer, and I place it next to the jet, humming on the page.” Irwin’s insistence on highlighting language as medium approaches how certain painters become more interested (and as a result, sometimes more interesting) in paint itself as the primary subject as opposed to external representation. The book’s final poems meditate once more on death, absence, and the ongoing negotiation of pleasure and regret, while still pointing to language as one of our best (though not infallible) guides through the tumults and tempests of life on the planet Earth in the twenty-first century.